Last year we were looking at how we could help Members keep their riding skills up to scratch after completing the Advanced Riding Course (ARC). A small number of people have taken advantage of Fellow Membership - where you are reassessed every three years - whilst others have gone for the Masters qualification, or have engaged in Observer training. However, for most people, after doing the ARC, their riding is not exposed to regular critical feedback. Now I don't know about you, but I know my riding can always be better! To bridge this gap, Rider Continuous Improvement Coaching (we call it the Ride Clinic) was introduced at April's AGM to allow members to get ongoing training without having to sign up for one of the more onerous routes. We are delighted to say that during the course of the last 6 months, 36 members have used the clinic, made up of anyone from people returning to biking after a break (winter hibernation or longer), to "just passed" associates looking to improve their riding skills even further. The clinics are tailored to the specific needs of each rider, are on a one-to-one basis, and let you decide where you will get the most from some additional input. Let's be honest... we all have at least one aspect of our riding we wish we could do better! The clinics will continue to be available throughout the winter and beyond, so why not contact John Burns on rideclinics@slambikers.co.uk to book a session! If you are serious about your biking, you'll be serious about making the most of it - maximising both enjoyment and safety. 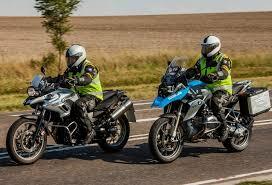 Advanced motorcycling is the ability to control the position and speed of the machine safely, systematically and smoothly, using road and traffic conditions to make reasonable progress unobtrusively, with skill and responsibility. Just a reminder that the IAM Group Ride Insurance does not cover a ride which is not led by a Committee Member, Observer or Approved Ride Leader. If you are leading an impromptu or other non-SLAM ride, please make sure this is explained to the riders. Thanks!